The low pressure area off the coast continues moving slowly eastward and will move across Central and Southern California later today and Thursday. Today and tonight Northern California will be partly cloudy to cloudy with scattered showers. Thursday there will a few showers over the areas east of the valley but they will be ending by late afternoon. Friday the southern end of a frontal system will brush the north end of the state with light rain or showers north of Redding. 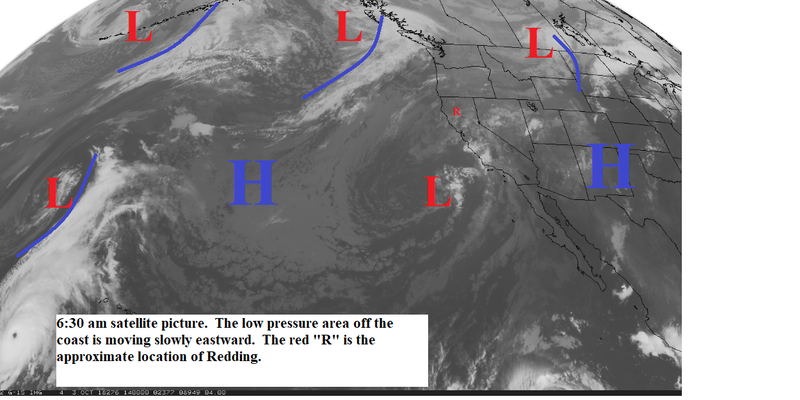 The weekend through the mid part of next week we will be caught between a large high pressure ridge off the coast and a strong low pressure area over the Great Basin (see map below). The north state will be mostly clear with near normal temperatures and periods of gusty north winds.